Warm, workable, wonderful wood. Our 2018 Flow Collection showcases some of the most beautiful timber the world has to offer. A material that is not only natural but that is sourced sustainably and locally in New Zealand. For us, using native New Zealand timber was an obvious choice for this collation of luxury furniture designs. Its strength, its tone and its structural integrity have been proven over decades and when integrated into thoughtful design by quality crafts people, the result is quite simply, spectacular. Making sure our materials are the best available, but that they don’t have a negative impact on our earth is one of the core tenets of our philosophy. So for this collection we’ve chosen to make the rich hues of New Zealand Rimu the hero. Not only that, but we’ve chosen to tell a tale of where these trees were born and thrived, then fell and were found. Every tree has a story, and in the FLOW collection, we try to celebrate it every step of the way by using rescued river Rimu. It’s part of our commitment to reduce, reuse, recycle, rescue and revere the resources of our beautiful country. Flow Side Table - Made of River Rescued Rimu and brass. An ancient tree, endemic to New Zealand, Rimu is a large evergreen conifer with the scientific name, Dacrydium Cupressinum. While it is relatively common in the native forests of New Zealand, growing in nearly every major indigenous forested area, it is none the less quite majestic. The Rimu tree can grow up to 50 metres and live up to 500-600 years. It’s also often the most dominant or co-dominant species, with the exception of beech forests. Usually found in lowland forest, it also occurs in subalpine scrub on Steward Island and is a member of the southern conifer group, the podocarps. Well regarded for its beautiful tones, ranging from a dark red to gold in the heartwood and a uniform pale tan in the sapwood, it was also highly sought after for its strength. The first people in NZ, the Maori, used the Rimu tree to make spears, canoes, torches and other tools. When the first European settlers arrived, they too recognised its durability and beauty and built houses, cabinets and furniture out of it. It is also a cherished resource in natural healing. The gum is bitter but edible and was put on wounds to stop bleeding. The bark can be made into a pulp and applied to burns, cut and ulcers. This timber is beautiful in and of itself, with unique patterns and forms embedded in its living structure. To honour this beauty, we strive to make each product as unique as the wood it is formed from. And to make sure we provide the best products, we work with only the most skilled and dedicated crafts people to bring that allure of the timber to life. When we started chatting to Andrew, at Treology, about making the FLOW Collection, it became clear quite quickly that Rimu would be at the heart of these designs. The Rimu they use is rescued from South Island rivers, a perfect match to our inspiration for the collection: the braided rivers of the South Island. Forming each piece from rescued Rimu which has itself sat in the twisting and running rivers of New Zealand’s South Island glacial valleys seemed like nature telling us we were doing something right. When they are sourced from the pristine river banks, the location of each rescued Rimu tree is recorded. 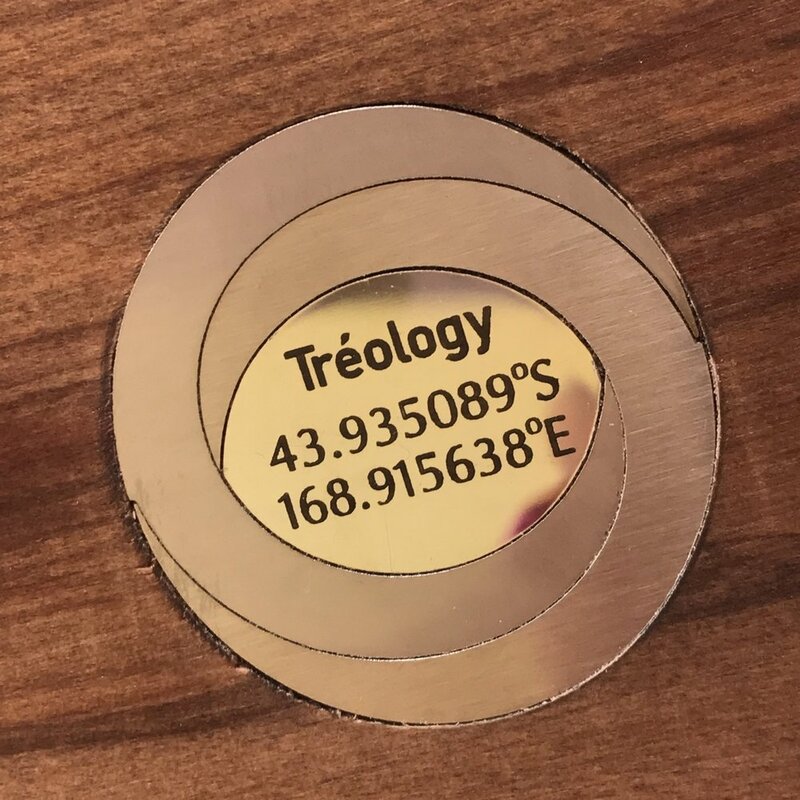 We loved knowing where our wood came from and so each rescued Rimu product in the FLOW collection features the coordinates of its source location - placed on the Treology logo. We felt that being able to find out where the wood comes from in New Zealand was a unique and very special quality. Something that lets us see a glimpse of the life cycle of this exquisite natural material. And something we wanted to share with our clients. Knowing the origins of the material adds to the beautiful story for each product. Treology Logo with the GPS coordinates of where the River Rescued Rimu tree was found. These natural materials are a precious resource and as they grow they draw their energy from the Earth. We try to reconnect to that energy as we begin the design process, allowing you a glimpse into the true beauty of mother earth. We hope you will enjoy the journey of owning one of these pieces. Kauri Tree in Waipoua Forest. we never really touch it, feel its solidity, its rough bark, and hear the sound that is part of the tree.